Portland is a city of two million residents with a 6% bicycle mode share. The city estimates that its cycle infrastructure has so reduced spending on gas use, congestion, healthcare and conventional transport, that it saves it $2.6 billion per year. Each day, cyclists take 20,000 trips across four bridges spanning the Willamette River.The Hawthorne, built in 1910, is oldest of the four bridges. Hawthorne Bridge. Image: Flickr CC. Tilikum Crossing, Southern Span, Portland, 2015. Image Tedder. George Washington Bridge. Image Hassan Diop. Port Authority’s Plan for GWB, 2024. Image Amman and Whitney. Source, Seattle DOT and NYC DOT. – Seattle DOT adds 25% pedestrian trips, pro forma, to Hawthorne and Tilikum bike counts. – Hawthorne-Tilikum traffic counts were weekdays. On the GWB, weekends. Hawthorne Bridge, 2015 – Federal Highways Administration Shared Use Path Level of Service (FHWA SUPLOS) grade of 2.90/D – Poor: Nearing functional capacity. Peak-period travel speeds are likely reduced by levels of crowding. More users will significantly degrade bicyclist LOS. Some users likely to avoid peak-period use. 6293 bicyclists per day on (2) 10′ paths. Tilikum Crossing, 2016 – 3.95/B – Good: Path maintains a high-quality LOS for bicyclists. Retains significant room to absorb more users. 2599 bicyclists per day on (2) 14′ paths. Hawthorne Bridge, 2016 – 3.30/C – Fair: Meets current demand and provides basic service to bicyclists. Modest additional capacity available; however more pedestrians, runners, or other slow-moving users will begin to diminish bicyclist LOS. 4692 bicyclists per day on (2) 10′ paths. 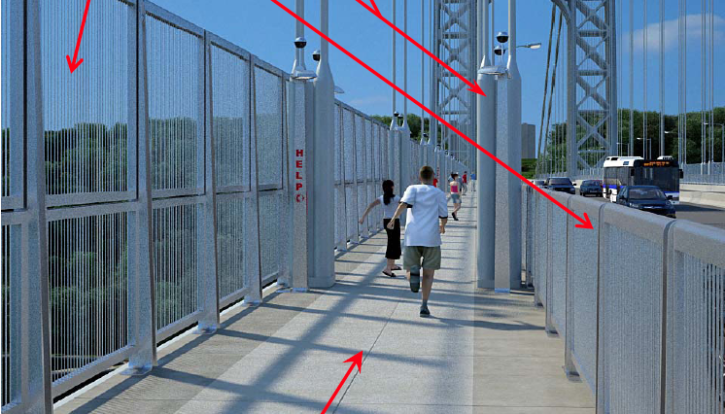 George Washington Bridge, 2015 – 1.71/F – Failing: Trail conditions significantly diminishes the experience for bicyclists, and most likely all, user groups. Significant conflicts should be expected. Does not effectively serve most bicyclists. 3699 bicyclists per day + 25% ped-runners (actual) on a single 6.75′ path. Or, 417 bicyclists and 107 peds-runners per hour in 2015. Data source NYCDOT. George Washington Bridge, 2024 – 1.94/F – Failing. 9034 bicyclists per day + 5% peds-runners (projected) on a single 6.75′ path. Or, 417 bicyclists per hour in 2015 * 10.43 * 9 years = 1018 bicyclists per hour. Presume 5% “pedestrian incursions” on the bicyclists’ path. 1018 * 1.05 = 1069 users per hour in 2024.